eBay has made quite a few changes to their site in the last few months. 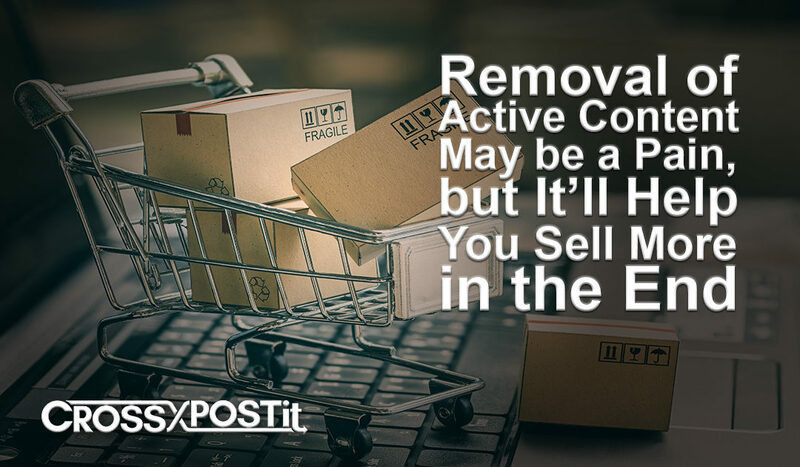 Stricter standards, fee changes, new eBay advertising, and most especially the removal of Active Content from item descriptions. This was the hardest hitting of the updates because it forced so many sellers to change the look, feel, and mechanics of their listings’ descriptions. It was a difficult update to comply with but, in the end, it will make eBay a much better selling platform. The goal of the update was to force eBay sellers to make their listings more mobile-friendly as a majority of listing descriptions on eBay are not mobile-friendly and do not display or work correctly on a mobile device. This is becoming more and more of a problem. As of June 2017, more than half of the transactions on eBay took place on mobile devices. In spite of this, very few of those sold listings’ descriptions could actually be viewed properly on the device on which they were purchased. What should sellers do? Many have had custom description templates created that mimic the look and feel of their previous templates. Some have ignored the update entirely and continue to list with descriptions that no longer function correctly. And a few have taken action to create a mobile-friendly template that functions without Active Content. But these sellers misconstrue eBay’s real intention behind the Active Content update. The end goal is to do away entirely with HTML item descriptions and this is the direction eBay sellers should be taking. The most important part of any web page, be it an e-commerce site, a streaming server, or a web tool is UX (User Experience). Even if the page content is excellent, if the interface between the content and the end user – the look and feel of the website – is unattractive, 38% of visitors will leave the page immediately. In the case of eBay listings, the main section of the listing is already a very well-designed UX. In most cases there is no need to use HTML descriptions. eBay’s photo gallery displays up to 12 high-resolution photos in an excellent swapper, there is no need to duplicate the images in the item description. Flashy text, view-counter and cross-selling widgets, and custom designs almost always just end up cluttering the page. What the end-user really wants to see is a short, concise description of the item. All that is required for this is one or two short paragraphs and sometimes a few links to extra information. The ultimate beauty and clarity in item description is simplicity. This will make for a much better experience for the shopper. It will standardize your listings and allow them to be viewed across all devices. It will make eBay a better e-commerce platform. And it will ultimately increase your sales and grow your business.